Briefly pass the tortillas through some lightly beaten egg before heating in a dry Teflon pan. This method creates tortillas that are indistinguishable from fresh ones. Rinse the beans and heat the Knorr Pronto Italian Tomato Sauce. Add the beans and some basil and season with salt and pepper. Clean the avocados and cut them into pieces. Prepare them with some Vinaigrette dressing. Clean the red onions and cut finely. Halve the tomatoes, remove the seeds and then cut into pieces. Cut the Green pepper into small dice. Pick the coriander and mix itwith the chopped onion, tomato, green pepper and the rest of the vinaigrette to make the salsa. Season with Knorr Lime Seasoning Powder. Heat the tortillas briefly on both sides in a hot dry pan. 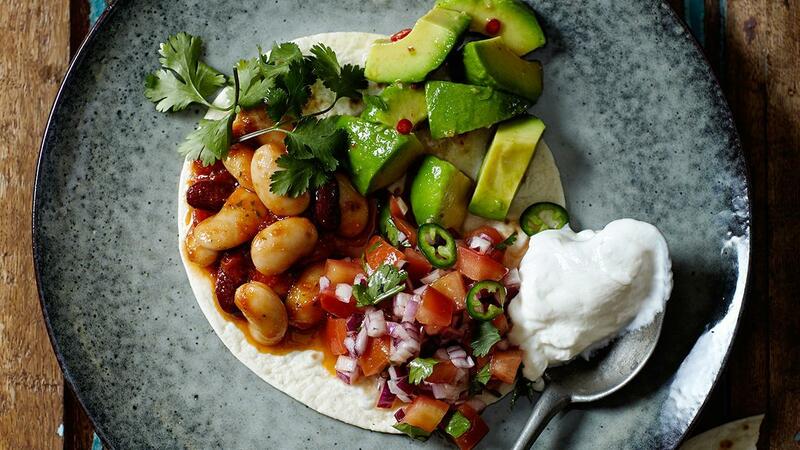 Place the tortillas on the plates and spread the beans, avocado and salsa on top. Serve with sour cream and garnish with some coriander.